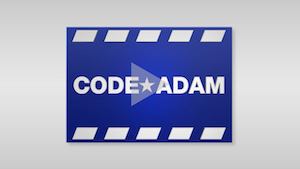 View the Code Adam training program. Code Adam is a "missing child" protocol created by Wal-Mart retail stores in 1994. It was named in the memory of Adam Walsh, the 6-year-old son of John Walsh, who was taken from a Sears department store in Florida in 1981, and was later found murdered. 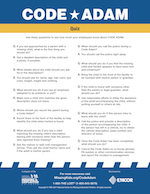 EMCOR Group is the national sponsor of Code Adam training with hopes of getting as many stores, amusement parks, museums, and other public facilities as possible to adopt the program as their missing child protocol. 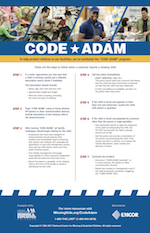 We believe that by expanding our teamwork even further, through support of the Code Adam program, we can create an even greater impact nationwide in helping to find missing children. Need more information? Feel free to email EMCOR Marketing for more information. 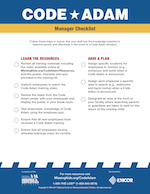 Manager's checklist to implement Code Adam.